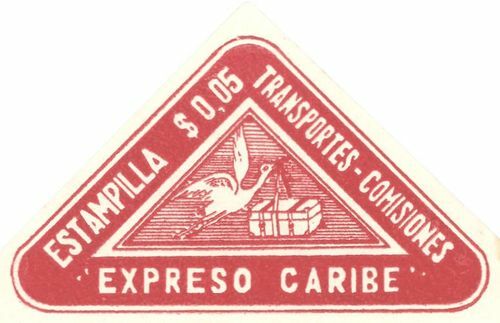 Colombian Semi Official stamps, nowadays referred to "Private Mail Carriers of Colombia", in Spanish called „Correos Semioficiales", issued by Semi-Official Express Companies, what are they? February , 2018. A second copy of the rare 5 Centavos red of Expreso Caribe added. September 2, 2016, an imperforated, previously unrecorded copy 10 Centavos denomination from the last Ribon set added. March 15, 2016, Information related to Garage Hudson has been updated to reflect recent research related to the use of the two type of postmarks and the offices where they have been used. March 9, 2016, an imperforated, previously unrecorded copy of 50 Centavos denomination from the last Ribon set added. January 6, 2016, A used copy of the rare stamp issued by Transportes Económicos Ignacio Rojas C. y Compania, cancelled with the previously unrecorded boxed cancellation of the Company has been added. Cover from the Cable Aereo de Cucuta al Rio Magdalena added. October 9, 2014, these pages will undergo a major facelift, and this index pages will give you an idea how they will look in future. November 2, 2013, a Featured Item / Showcase Page has been added were interesting items will be shown. October 24, 2013, a Revision History Page has been created where older update entries will be transferred to. September 14, 2013, a apparently new Private Carrier has been discovered, the "EXPRESO SANTANDER", in addition, another Postmark Type has been added for "Flota Sonson - Dorado Ltda.". August 5, 2013, some rare and literature known cover from Correo De El Universal & Correos Diarios Manizales, Empresa de Autobuses ”Antonio Puerto”, Ferrocarril de Caldas, Flota Magdalena S.A, Rápido Magdalena and Sociedad de Autobuses ”Colombia” have been uploaded.